The charger itself is a great piece of technology allowing charging, discharging, testing and refreshing NiMH & NiCd batteries on four individual channels.As other reviews indicated, parameters can be set independently on each channel and you have knowledge of what's going on.You can make sure the batteries are performing as they should and mix & match batteries of similar capacity for top performance in each application. Included are 4-C & 4-D adapters, however you cannot use both sizes at the same time.To use as D-size cells, you first insert AA's in the C adapters and then slide the assembly in the D adapters.I was hoping to find 8 useable adapters in the package, keep in mind you only get 4.The D adapters feel flimsy and I don't know how long they will properly snap together before breaking. Also worth mentioning, the included AA batteries, after three refresh cycles, show capacities of 1450 / 1750 / 1800 / 2000, I find the top three to be adequate for a rating of 2000 mAh but one is clearly on the low side.Haven't tested the AAA's yet as I don't really need them. I find this charger to fit my needs very well as an all-around household AA charger.I would buy again for sure. DOA = Dead On Arrival: powers up but won't change mode or display or charge rate. Whether that's bad luck or bad quality control I can't know for sure, but the item probably wasn't given so much as a cursory function test by its Chinese manufacturer. La Crosse Technologies suggested I ship the dud to them (at my expense) for evaluation and repair. That's unacceptable customer service for any new device, and it is NOT what I paid for. Good service (the kind that keeps old customers and earns new ones) is promptly shipping the customer a new TESTED replacement and a paid return carton for the dud. La Crosse evidently doesn't operate this way, so back to Amazon it goes for a refund, and La Crosse finds itself on my short list of least-preferred vendors. Because this device is evidently not even tested for function before it is sold, one might reasonably question its accuracy. The best a typical user of a working BC-900 can probably do is run a single cell through each of the four sections and see how well (or poorly) the readings match, thus arriving at some idea of its consistency. I test cells with a very cheap (except for the meter) simple assembly of two diodes, a resistor, an averaging multimeter (Fluke 87 type III) and a clock, and the results are traceably accurate to < 1%. The power supply's plastic casing is welded, not screwed together. Replacement of a damaged cord will therefore be needlessly difficult or impossible. The switching power supply design (a type used also by Duracell) makes for a lighter and smaller 12-watt "wall wart", but for an item this expensive WHY would the manufacturer choose 3VDC as the "wart's" output rather than the common and car-friendly 12VDC used by quality brands like DynaCharge (Duracell) and UniRoss and Maha? That weird 3V design means mobile users will need an expensive bulky power inverter or special voltage-regulating adapter to run this charger from a car's lighter socket. ps: Amazon refunded the price including shipping, and arranged free return pickup and shipping through UPS. That's the kind of service that will keep customers for years. The La Crosse BC-900 is an intelligent battery charger for 1 to 4 AA or AAA batteries at a time. Each channel is independant of the others, and you can mix battery sizes and functions in each channel independantly. The charger has 4 modes. Charging mode is the default, but it also has a discharge mode, test mode (discharges, then charges back up again, and shows capacity of the battery), or refresh mode (repeats the test mode up to 20 times, until it doesnt see an improvement in the test result). Each charging channel has an LCD readout that can show the charging current, the voltage of the cell, the capacity of the cell (in ma if under 2.0 amps, or in amps if it is a 2000ma cell or higher) in test or recharge mode, or the time it has been performing the function it is currently doing. It is the readouts which make this charger exceptional! It can help you identify under-performing batteries, and makes it easy to match cells by the actual battery capacity, not a guess just because the batteries were from the same package. You can charge batteries at different charging rates, ranging from 200ma up to 1.8a. You can be charging at different rates in each channel, but just need to keep in mind that the charging rate you choose in channel 1 will be the maximum charging rate on any other channel. Keep in mind that while you do have control over the charge rate, if you charge at too high of a value, the cells can heat up quite a bit. The unit does have thermal shutoff to protect the cells, but heat can damage nimh cells. 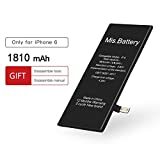 The default rate is 200ma which is a gentle charge rate even for AAA cells, but if you are using AA batteries, you will probably choose a higher charge rate. If you choose the discharge, test, or refresh functions, you can choose the discharge rate. With the test and refresh functions, the discharge rate will always be 1/2 of the charging rate. 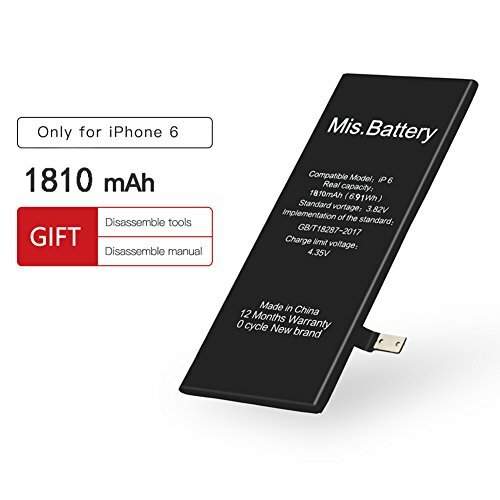 It will discharge the battery down until the voltage of the cell reaches 1 volt. In test and refresh functions, it will then charge the battery back to full capacity. Worked just fine..... for a while! However, a few months ago it developed a horribly irritating flaw -- the LCD screen would simply go blank, and had to be reset (PITA, because it doesn't have a reset "button"; instead, you have to straighten out a paperclip and shove it into a small hole in the back). I've emailed the folks at Oregon Scientific about this problem, and they suggested a variety of things that they thought *might* correct this behaviour (i.e. make sure the transmitting and receiving units are at least 10ft apart, try switching to a different channel, etc). Unfortunately, none of their suggestions had any effect on the problem, and it just continues to get worse (i.e. I now have to go thru the reset process 2 or 3 times before the display comes back). And a subsequent email to the Oregon Scientific folks 3 days ago has yet to be responded to. So while I was satisfied with this unit at one time, it is now just worthless, and I consider it to have been a waste of my money. I have owned this unit for about three years. The outdoor sensor resides on a column under a covered patio at the rear of my home. The receiver is in the home office, which is approximately 40' from the sending unit. The signal must travel through four walls to the receiver. It has worked like a charm from day one and is extremely accurate. Batteries have been changed only one time during my ownership. I purchased another sensor for another part of my home, which is indoors (and further from the receiver and has more walls to penetrate than the outdoor sensor). So, I have three readings around my home...one outside, one in my home office and another upstairs in a remote room. This system is strudy, reliable and has a very nice appearance. I like having the information displayed on the remote sensors as well. One glance and I know what is happening when at those locations. You cannot go wrong with Oregon Scientific. I am amazed that the cost of this monitoring system is so reasonable, given the quality that is present. I am now purchasing a duplicate system for my beach home. You will never regret having chosen this package for your weather information needs. A conservative five+++ stars goes to OS and this product. I originally boiught a GE unit from Target. Piece of junk, very inaccurate. I wanted to monitor the humidity in my basement workshop with a dehumidifier. With the extended unit, i can monitor my bedroom and with another extra extended unit i monitor my babies room. All 3 separate units, the main unit and 2 extended units placed together showed very similar readings. 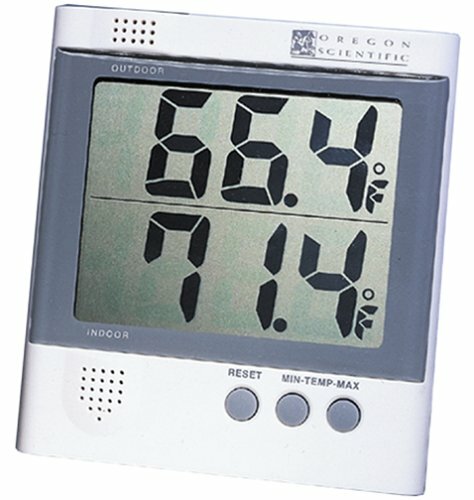 The GE product was over 15% wrong with humidity, (they say it's calibrated within 5%). 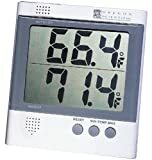 I also brought the Oregon Scientific units outdoors and checked the humidity against what the National Weather Service reported for the area and it was right on. The GE unit reported 80% humidity in a while the OG units showed 65% as reported by th Nation Weather Service. They seem more substantial pieces and not toys displaying big LCD numbers and graphics. 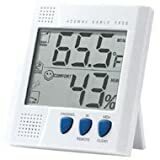 These are not expensive compared to really high end humidity measuring devices so i expect inaccuracy and can tolerate inaccuracy within reason. (Unlike the GE sold at target) Therefore this product meets and even exceeds my expectations. I believe it represents honestly what it intends to do for this price range. 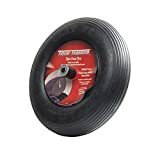 It seems that I could rarely get more than about ten uses of a new wheelbarrow tire before a heavy load over hard, uneven surfaces would cause a flat in a supposedly "flat-proof" tire. And then I'd have to go back to the hardware store, invest another $10 or so and put a new tire on, inflate it, try to balance it and basically waste another ten bucks and another hour of my time as it would pop and go flat again shortly. Getting tired of this, I decided to ante up and give this one a try -- and I'm thrilled! It feels like an air-filled tire; the solid material is a bit like soft, air-filled rubber which acts as a shock absorber over bumps and uneven surfaces. But when you bounce this one around or roll it over hard and sharp surfaces with hundred-pound loads, it just keeps rolling and coming back for more! I only wish I bought this when I first assembled my wheelbarrow. When adding up the cost of frequently popping and flattening air-filled tires, in the long run this is a very good investment for anyone who frequently uses a wheelbarrow with heavy loads. It WILL pay for itself over time, and plus you don't have to hassle with replacing a tire as a regular ritual. Do yourself a favor -- plunk down the sixty bucks and invest the money in a solid, flat-proof tire such as this one. You will be pleased when it's still going strong months, even years later. The reduction in flat-induced aggravation alone is worth this price several times over. You certainly get what you pay for.